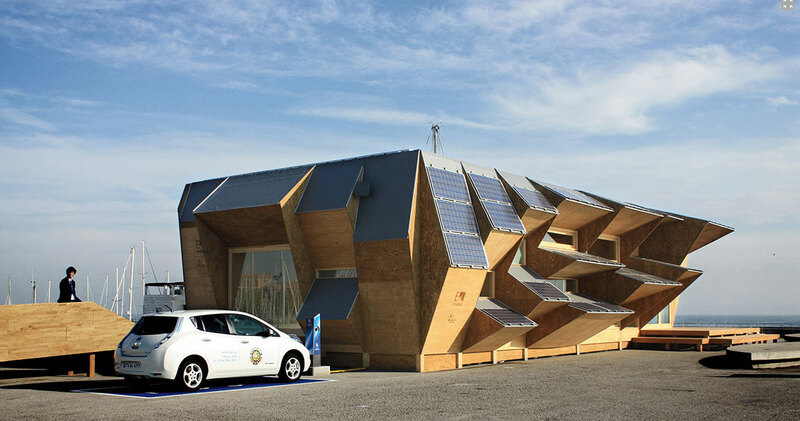 The Endesa Pavillion, Solar House 2.0, is a testbed for informational grid technologies, driven and designed by Iaac with the support of Endesa. 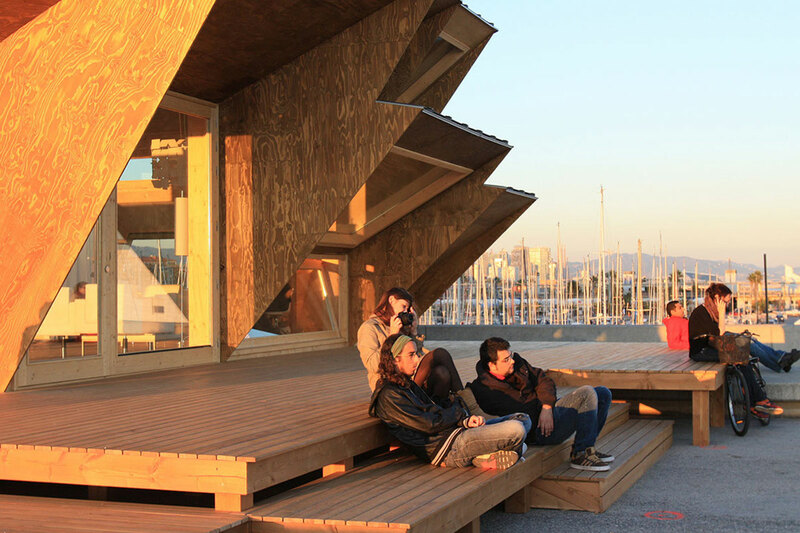 The pavillion, settled at the Olimpic Port of Barcelona on the score of the Smart City BCN Congress (www.smartcityexpo.com), will be installed at the Marina Pier since november 28. The structure brings the distributed intelligence concept to the realm of architecture through a multiscalar aproach. The project aims to define an adaptative constructive system able to respond each solicitation at the lowest scale. By doing this, each single module could answer to his own structural, energetical and enviromental needings. The skin will act as a network of inteligent nodes, a "solar brick" that protects from the solar radiation, collects and storage the energy the data at the local scale. During one year it will perform as a meeting point for knowledge interchange as well as a benchmark for smart grid technologies. Distributed intelligence The project is an exercise in which a building, under the guidance of the block type of Barcelona, ​​is adapted by adding a series of modules on its facade. These modules, which are seen as triangular pieces section, make possible for the building to optimize energy and spatial intelligence. Its size and components vary depending on the orientation and inclination of the sun, the relationship with the environment and other technical needs. Therefore, by varying their parts, the system we apply is not the repetition of a formal standard, but the repetition of a logic that is distributed through these modules. In terms of energy, these pieces have in their top photovoltaic panels (1) for solar energy capture. They are also equipped with superior protection, as a visor or forward (2), or side panels (3) to provide passive protection against solar radiation during the hot months, or allow radiation to enter during the cold months. The building is therefore playing with the orientation. Another objective that we pursue is to maximize the extent of interior space. This will get accommodation facilities and storage space for the side modules, leaving the space free of obstacles. 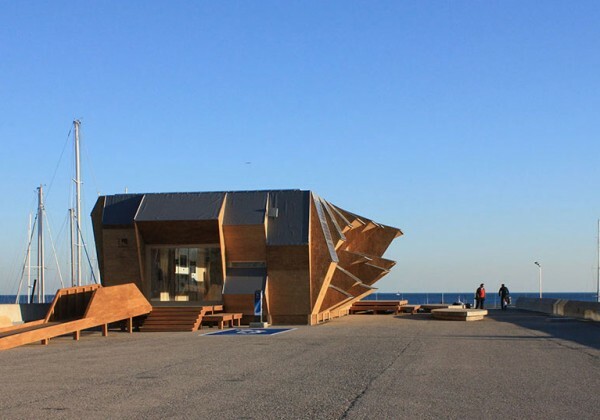 Endesa's pavilion is the result of the orientation game through the use of these modules perimeter. The design and position of these front modules not only depend on the orientation but also the relationship the building has with its environment. Forms follow energy In Barcelona´s block type, ​​where the corner chamfers look at each of the cardinal points, we get two fronts from the south (SE and SW) and two from the north (NW and NE). 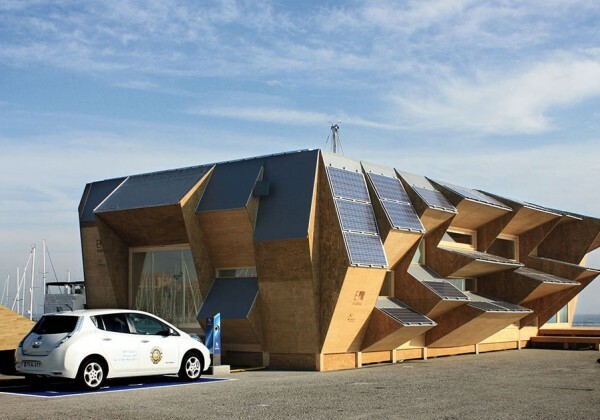 The photovoltaic energy capture is housed in the facade from the south and on the cover. The inclinations of these panels vary depending on the main orientations. The southerly facades are equipped with modules ready for when the winter solar radiation gets inside, with maximum inclinations around 30 degrees, heat accumulating greenhouse gases. And for summer solar radiation, with maximum inclinations about 70 degrees, do not go inside, latter case also provides vertical protections to protect from the sun under the summer. Therefore in winter the windows will be sunny, heat gain and in summer the windows are in shade, avoid heat gain. The facades from the north are closed. They tend to protect themselves because they do not receive sunlight in winter. House and bathroom facilities make a thermal barrier to the most unprotected part from the cold. Solar material We built a solar house with solar material. 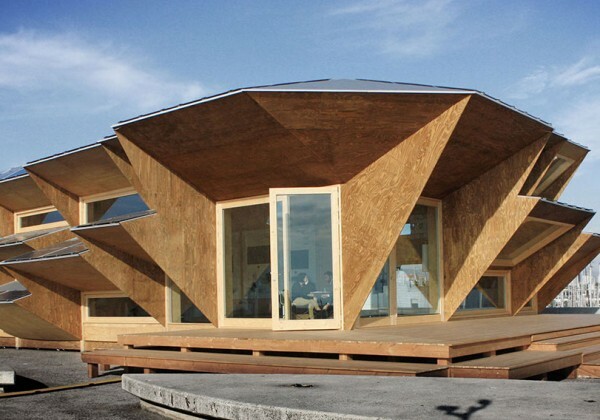 Wood is a living material that grows in the sun. It is an inexhaustible material produced in culture. 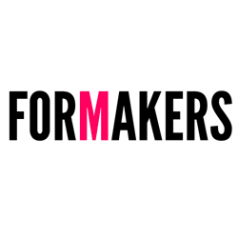 Is a soft, accessible, easy to work, adapt and join. It's a warm material, which provides high thermal insulation. The wood that has been built the pavilion comes from several sources: the structure and main panels belong to the Filand forest crops. Digital Fabrication The software design has been carried out using parametric tools. These tools allow us to govern the project using the criteria outlined above, but translated by mathematical equations that produce and alter the geometry of the building. The parameters defined geometry are based on solar inclination, orientation and openings to the outside. The system that is proposed is designed to be fabricated by CNC machines, that provide high execution speed. In fact, the pavilion has been built in one month term. This is possible thanks to the production of parts that are defined in digital format string and cut into very quickly, even if they are completely different from each other. In addition, we expect that wood is a material easy to cut and carry. The system that is proposed is designed to be fabricated by CNC machines, that provide high execution speed. In fact, the pavilion has been built in one month term. This is possible thanks to the production of parts that are defined in digital format string and cut into very quickly, even if they are completely different from each other. In addition, we expect that wood is a material easy to cut and carry. Besides speed, another of the great achievements of this fabircation system is precision. Currently you can have a digital design that controls the millimeter what is going to run into work. Encounters between pieces have been resolved through software, and the pieces are cut into the system thinking that are in the building. With this precision, the pieces of wood come to work for meetings with the recesses and holes for receiving bolts. Perimeter facade modules are produced and assembled at the factory, so that on the work should only be fitted, further increasing the efficiency of construction. Besides speed, another of the great achievements of this fabircation system is precision. Currently you can have a digital design that controls the millimeter what is going to run into work.